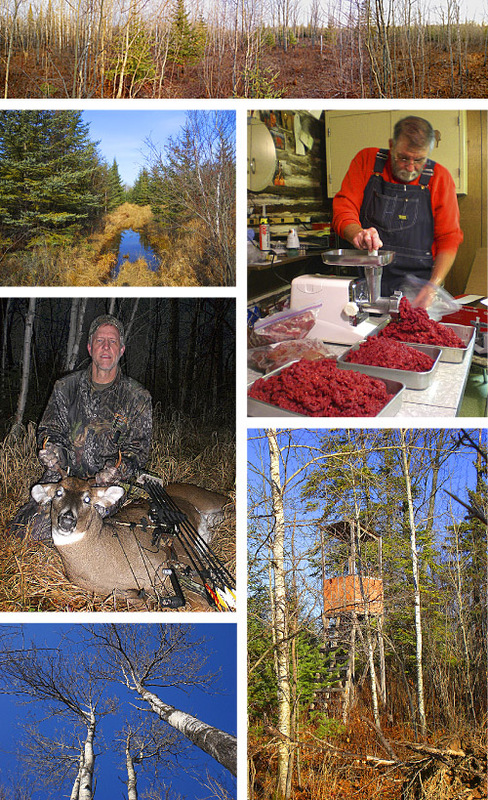 Pictures featuring a Minnesota Deer Hunt. 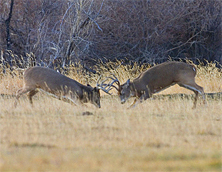 It was mid-afternoon, the day before opening rifle season, when Rick connected with a nice 6-point buck. 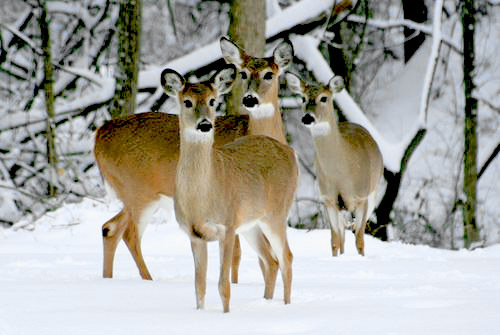 At deer camp, everyone was anxious for Saturday’s morning hunt. Congratulations Rick! 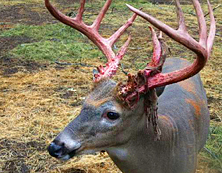 A True Hunter Get’s His Deer: Earn Points by Staying Out In The Woods! Today, I shot the biggest deer of my life. Granted, it’s no 10-pointer, but it was a very large 8-point buck! I spent the morning in my tree stand and part of the day walking the woods; sitting in everyone’s deer stand. The rest of the crew was back at the cabin watching movies and eating popcorn. By late evening, I decided to go back to my tree. I put deer scent all around my stand and on the neighboring deer trials. Before long, this guy, an 8-point buck, comes walking fast with his nose to the ground following the stink I’d laid out for him. He walked within 20-feet of me. I figured there was no sense in ruining any of the meat, so I put one in the neck. Damn good shot I must say — with open sites! He dropped right were I shot. I’ll be taking this one home and processing the meat myself. I really enjoy making deer sausage and sharing the results with my friends. It goes to show…the true hunter that stays in the woods gets the deer! 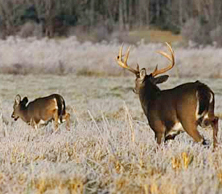 A Hop, Skip and Jump Away: Hunting Ontario’s Big Bucks is Not Easy. It was the week of Halloween 08 and Matt, Tim, Ryan and I traveled to the Northwest Angle of Lake of the Woods, about 450 miles from the Twin Cities to Ontario, Canada. This is serious big buck hunting country! Pictured below: Tim and his 9-point buck! We had a little problem Saturday morning trying to get our hunting license, but once we found someone who would sell us a license, we quickly packed our boats and were on our way. The first day was simply scouting and putting up tree climbing stands.